This season, don’t miss the excitement brought to you in an old fashion way. 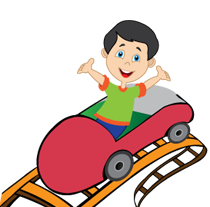 Of the nineteen rides at Funland, we have something to excite the whole family. They range from classic rides, like the carousel, to more modern adventures aboard the Superflip or Freefall. The park offers great attractions for the whole family, featuring more than a dozen rides, midway games, an electronic shooting gallery, redemption center and an arcade with video and pinball machines. This is a family owned and operated business since 1962, Funland provides family fun at reasonable prices for those who visit us each summer. The season begins Mother's Day Weekend and runs through Labor Day. In the early part of our season (May into June).